Have you ever tried to convince somebody that salad can be a meal? Not a side dish, not a garnish, not a appetizer, but a meal. Dinner, served. It’s not always easy: here in the CR universe, salads are the stuff of feasts. But to many people, the word “salad” signifies nothing but greens, a drizzle of oil, and a watery vegetable or two. And given the mediocrity of your typical mesclun salad appetizer in a restaurant, can you really blame them? I love salad. It’s my favorite meal by far, and for so many reasons: it’s versatile. It’s nutrient dense. It’s fresh. It’s crisp. It’s usually at least semi-raw, if not all raw. It’s a blank canvas, a vehicle for countless flavors and textures. 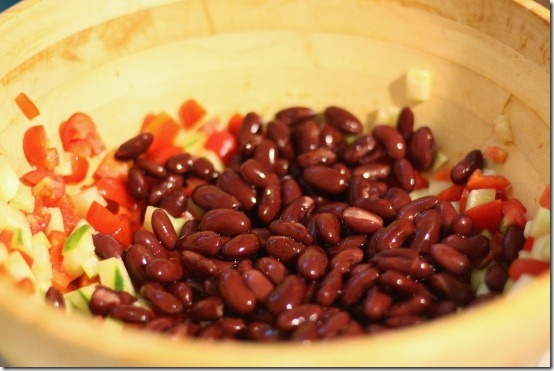 And, if you shop for your produce wisely, it can be a very quick, easy, and economical dinner. Sharing my passion for greens with the universe means showing friends, family, and readers that there’s nothing puny about a great salad. With a little creativity, it’s easy to build a meal-sized salad. And once you get into the habit of piling your salads high with healthy sources of fat, protein, and complex carbohydrates—not to mention exquisite piles of fresh, raw vegetables—you’ll never relegate salad to an appetizer plate again. Still enchanted with last week’s quinoa and black bean salad with quick cumin vinaigrette, I decided to make a few modifications, to add some scrumptious (and filling) seared tempeh, and to top it all with a thick heap of fresh avocado. The overall effect was a perfect tribute to the Candle salad I love so much! 1) Cook quinoa in salted water till tender and fluffy (use a rice cooker or the package instructions). 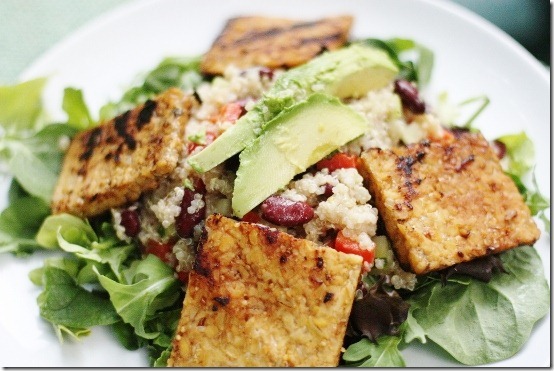 2) While the quinoa cooks: in a large, shallow bowl, whisk together all of the tempeh marinade ingredients. 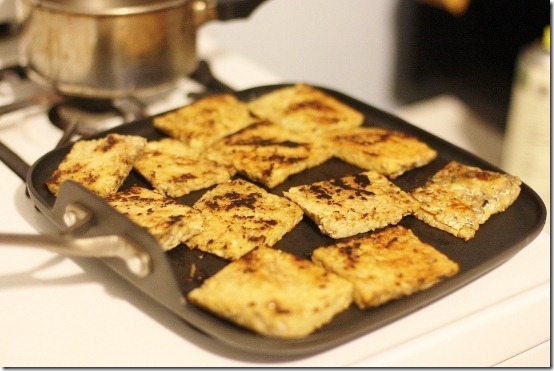 Cut the tempeh into 12 square pieces (I like mine thin) and submerge them in the marinade. 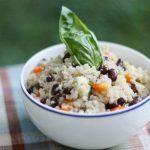 3) When the quinoa is ready, add chopped vegetables, black beans, and herbs to the cooked grain, and toss. Whisk together the vinaigrette ingredients, and pour about 1/2 cup over the quinoa, beans, and veggies. (If you don’t feel that you need all the dressing, just add as much as you’d like to.) Toss it all together. 4) Heat a skillet or frying pan with coconut oil spray or about a teaspoon of coconut oil. Over medium heat, sear the tempeh on both sides till nice and crispy. Brush with marinade as you go along. 5) Pile 2 cups mesclun greens on each plate. Pile it high with a heaping cup of the quinoa and bean salad. Stack 3 thick pieces of the seared tempeh on top, and then top each plate with 1/2 a sliced avocado. Drizzle more vinaigrette over each plate if desired, and serve to your (satisfied) guests! 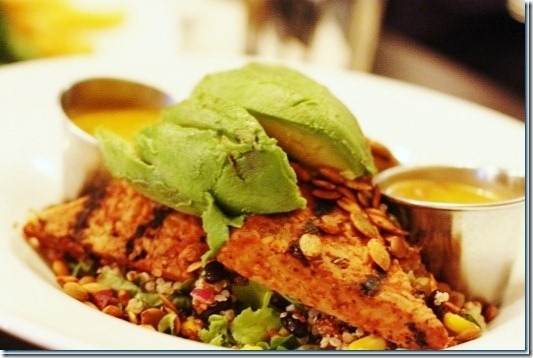 This spectacular summer meal will satisfy all kinds of eaters: vegan, omni, health freaks, and foodies alike. And as you watch your guests like the plate, give yourself a pat on the back for having put salad at the center of everyone’s dinner plate. What’s your favorite meal-as-salad? How do you sell salad to non-salad lovers? a dish inspired by the aztez salad?! that’s one of my all-time fave candle cafe meals. you are my hero!!! Omg Gena this looks phenomenal! Yes. All the time. I used to post all my salads-as-meals and got so sick of “defending” my food choices in my comments section that I stopped posted them. People either get it, or they don’t. I get it. I love salads as meals. Nuff said. You shouldn’t give up Averie! 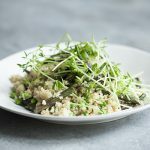 Those of us who appreciate your recipes and huge salads are alway looking for new creative ideas (I know I get stuck in a rut very easily with my meal salads). So here is one reader who would appreciate it if you would post something new and creative now and then. I’ll defend you in teh comments! Thanks Gena, for posting a (creative!!!) 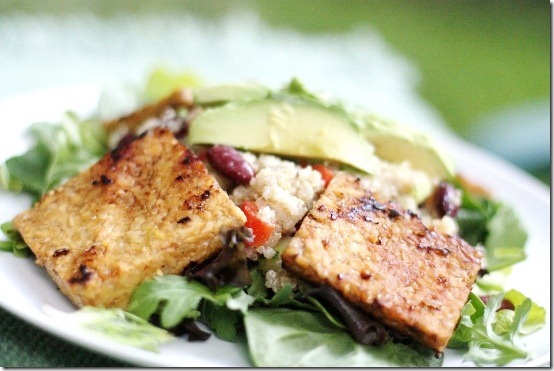 salad with Tempeh…haven’t used it much (not yet a fan), but this looks so yummy, I’ll have to try it! I try to convince my boyfriend all the time that salads are meals! He doesn’t get why I just love awesome salad bars. I think it’s a lost cause. This looks phenomenal, such a nutrient-dense, easy meal!! Thanks! A salad can totally be a meal! But to be satisfying enough for me, it has to have fresh greens (preferably dark), a great dressing (number one requirement), a nice combination of textures, and somewhat of a macronutrient balance. I love beans and grains in a salad. And tempeh is great, of course. My favorite salad EVER is the caesar salad at my favorite vegan restaurant. 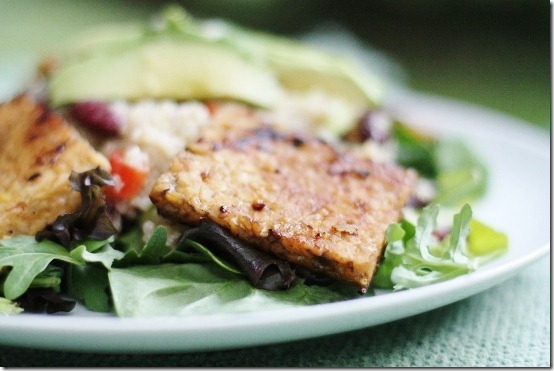 With blackened tempeh in it…it’s amazing! They make the best GF blue corn croutons. Anyway, I’m completely on board with the meal-as-salad concept. I’ve heard numerous times from people that they don’t like to “eat leaves” for dinner. Oh, how I hate the “leaves” reference! Your salad looks completely satisfying. I bet it would change a lot of minds! Salads are almost always a meal in book! You’re right, salads are much more than just a few pieces of lettuce and some rogue tomatoes. Just look at the one you created! I love tempeh on salads, though I gotta be honest. I won’t be turning on my stove until DC ascends from hell at some point in oh, I don’t know, October? Then maybe I’ll make tempeh again! This looks like another winner. Can’t wait to try! Aw, for some reason I really love this post. It’s so quintessential CR! And maybe it’s because I’ve been eating big monster salad meals literally 5 nights a week for the past month or so. I definitely go through salad phases myself, but I always love them and always have. I never had to “learn to like them” either, I grew up with them and even eating them as an entire meal – Thank You Mom! Anywho, this looks divine. I’m a tempeh fiend, a quinoa fiend, a cumin fiend. So yeah. Heaven! This looks awesome G! I sent this post straight to my mom, she will die. Eee Gena this sounds so dope! I have been wanting to make a quinoa salad so badly, I’m so glad you posted such an inventive recipe. Plus the vinagrette kinda looks like it could be my new obsession for salads. LOVE! candle cafe…oh one can only dream of one in every city. there is a place in seattle that has a nice filling salad with quinoa and tempeh too. it’s mama africa at plum in case any seattle readers out there. good stuff. I love huge nutrient dense salad piled high with my favorite accruements: avocado, beans, nuts, tempeh, quinoa, oil, seeds, veggies, avocado, etc. I can’t go a day without one! This looks amazing! 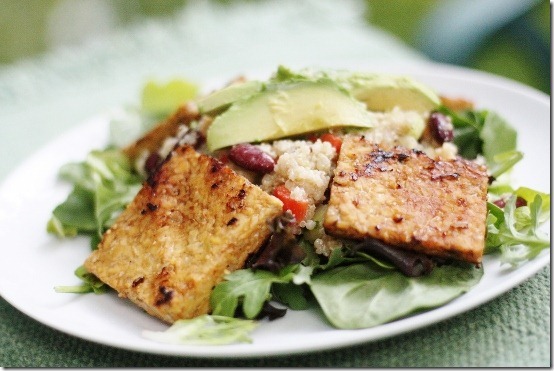 I am especially admiring that perfectly crispy marinated/sauteed tempeh – one of my favorite salad additions for sure. I can’t wait to make this. Re. a previous culinary creation, I finally made your sweet potato hummus last night – LOVED it! I hope you allow yourself some down-time this weekend, Gena. Definitely making this over the weekend! Love that salad at Candle! Yum! Thanks, Gena! Totally on board with salad-as-meal concept. I grew up eating salad (if you can call lettuce and tomato and bottled dressing “salad”) every night, albeit as side dish. When I became anorexic, the other parts of the evening meal fell away, until all that was left was the lettuce and tomato – without the nasty dressing. As I got healthier, the salads got bigger, and more nutrient dense, but “salad for dinner” stuck. It is a happy habit I’m unlikely, ever, to get over. To this day, even in the dark of winter, it’s a rare evening meal that’s not salad-based. I eat other things, of course, but always as accompaniments. In fact, if I’m ever not having salad for dinner, it’s probably because I’m skipping dinner altogether in favor of dessert. Yes and my mom is still not convinced that salad is a meal. 🙂 This salad looks wonderful, especiall the marinated tempeh. I love dumping random leftovers into a basic salad to economize and make it a meal salad, like cheesy hemp sauce, quinoa, roasted veggies, and even baked sweet potato fries. 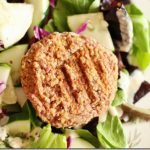 I’ve been looking for a new tempeh recipe! I think I’ll try sriracha instead of tabasco — I’m excited! I absolutely love quinoa salads! That and anything else with some grains and kale. Nom nom nom…so delectable! This look so good. I can’t wait to make it. My “jury” is still out on the fermented taste of tempeh so this marinade sounds great. 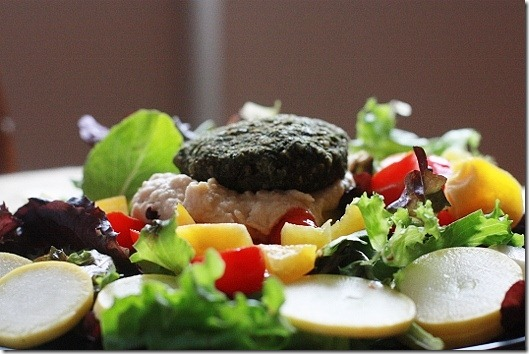 For me, for a salad to be a meal it needs grains – whether it be buckwheat or rice or whatever. I like the heartiness and texture that grains add. Smoked tofu is a must too! I love this post because I eat a ton of salads as meals. I put a big pile of romaine in a bowl and throw in lots of fresh or roasted veggies, hummus, some nuts and call it a meal. Some of my friends think “oh you always eat salads, how boring, you’re so healthy all the time (as if that’s bad)” but people don’t realize you can truly make them into a well balanced, filling and healthy meal. I love them because they take a long time to eat and have a lot of different textures in one bite! This was delicious. My husband said it was “exceptional”! Blimey, that looks fantastic! I’m not a huge quinoa fan (please shoot me) but i see endless whole grains possibilities in there. I really love pesto salads (bed of arugula + purple lettuce or spinach – or both + cherry tomatoes + grilled capsicums + chickpeas + red onions – i know you hate them, haha – wheat berries or brown rice or gluten free pasta + pesto). Its the best. Such a great meal & my whole family would love that tempeh. Gena, made your Quinoa and Bean Salad with Tempeh today for lunch! My husband told me to tell you… “it was very satisfying!” I thought that was a great compliment from a former meat-eater! 🙂 Marinade and dressing were good! Late this afternoon I started craving your Tofu Tahini Scramble so made it for dinner tonight! That recipe is my all time favorite! I tend to make it whenever I’m extremely hungry because it’s so satisfying and filling! Sure do appreciate your posts! I just made this for dinner tonight and it was wonderful! I am looking forward to making many, many more of your dishes. I just found your website and I wonderfully amazed! I made this for dinner tonight and it was amazing!! I can’t wait to go to the new UWS Candle Cafe to try the Aztec Salad now that I’ve tried this! Delish! I added some mango as well 🙂 You meals always amaze me. I swear you can read my mind about what flavors I want & have a hard time creating myself, and create a beautiful masterpiece without me even asking 🙂 I am very thankful that you share with your blog. Not many of my friends, family, or neighbors completely embrace my plant-based eating habits. It is nice to have some support and find some comfort within your blog and other online communities.